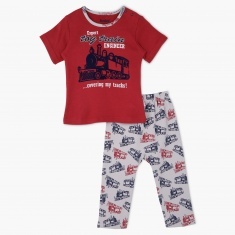 Wish your little one a good night sleep with this comfortable pjyama set. It comes with a cosy fabric which is soft against the skin and a quality to root for. The printed t-shirt with round neckline and elasticized pyjama makes a lovely combination.